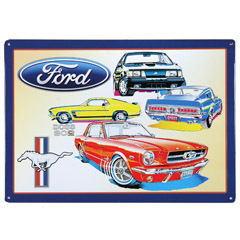 If you're looking for Ford Mustang Tin Signs to decorate your garage, room or as a great gift for that special someone, you'll enjoy the huge selection and great prices. For complete information including pricing, just click on the blue link. 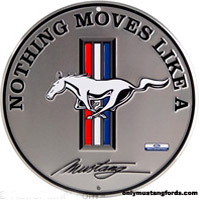 Created with a classy silver gray background, this Nothing Moves Like a Mustang round tin sign is a great additon to your favorite Mustang enthusiast's corral. 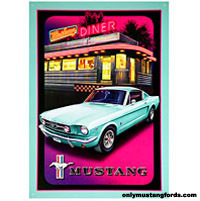 A classic diner and a classic Mustang GT fastback, the perfect combination for your own personal Mustang Diner Tin Sign. It's hard to get better than this, a large scale (23.5" high x 24.5" wide) Ford Mustang Badge tin sign. Your own piece of collectible history. How cool is that? 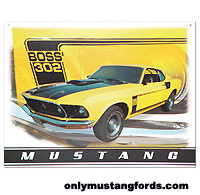 If your favorite Mustang is a Boss 302, this is the perfect Mustang Boss sign. It features a very nice 1969 Boss 302, complete with hood pins, scoop and rear window louvers and naturally, its decked out in Bright yellow aka "last stand custard". Hurry! Your wall is waiting. Maybe you or that special someone like all kinds of the famous Ford muscle car. Then this could be the piece you have been searching for. Featuring models include the iconic 1965 coupe, to the potent 90's SVO Mustang and more, this four generation Ford Mustang sign is a sure winner. 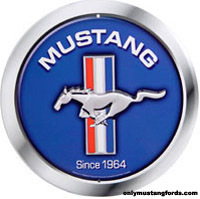 Some of the most popular Mustang signs are the logo signs. Check out this cool Red Ford Mustang logo tin sign. Here's another great metal sign. It's a Ford Guardsman Blue Mustang sign , celebrating the popularity of your favorite pony car since 1964. Need an RC Mustang ? section, which includes a ridiculously fast 2012 Boss 302 rc Mustang.